Safety glasses are an important part of the dress code for a great number of jobs and hobbies. From metalworking to motorcycle riding, protecting your eyes while you carry out potentially harmful tasks should always be at the top of your list. After all, without your vision, those very tasks would not be possible. For many people, finding safety glasses that fit well and look nice is a tedious experience. Nobody really enjoys spending hour after hour searching for the perfect glasses or goggles, and doing so with the knowledge that you will need to start the process all over again sometime in the future can make the job especially daunting. 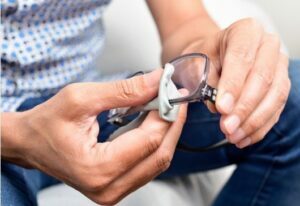 For this reason, extending the life of your prescription safety glasses and goggles should be considered when deciding how you will care for your eyewear. Because the best way to take care of your safety gear is not always obvious, we have taken it upon ourselves to share some of our favorite tips for making your glasses or goggles last as long as possible. The lenses on your safety glasses will inevitably become smudged, and depending on what kinds of activities you plan on carrying out while wearing them, will sometimes become downright dirty. Therefore, it is crucial that all owners of glasses and goggles know how to properly clean their lenses. For smudges, simply wipe the lenses with a clean, soft, lint-free cloth. Microfiber is a good choice for this particular job. If your glasses are dirty, use warm water and a bit of dish soap to wash them. Use that same soft cloth for drying purposes. Never use window cleaner to clean your glasses. The chemicals can damage any coatings on your glasses. Never use paper towels or tissues to clean your lenses. Paper products leave small scratches that obstruct the view of the wearer. If you do acquire small scratches, consider rubbing a bit of non-gel toothpaste on the scratch. Often, this will take care of the problem. The arms on glasses become loose over time. Instead of tossing your eyewear when this happens, simply repair it. All you need for this job is a small screwdriver and a bit of patience. By tightening those tiny screws on the hinges of your glasses arms, you should fix any looseness and be back in business in no time. Always keep your glasses in a hard case. This prevents breakage should they be dropped, and helps keep the lenses clean and scratch-free. Store your glasses and goggles out of reach of pets and children. Obviously, your dog and your toddler should not be trusted with such important pieces of equipment, and should they find them, they would probably not be quite as gentle as you would like. If you will be storing your glasses for a long period of time, make sure they are completely dry and stored in a dry place. Too much moisture could lead to rusting on the screws and other metal parts. If you are on the hunt for the perfect pair of prescription safety glasses or goggles, we encourage you to have a look around our website. We offer a wide selection of high-quality eyewear for a variety of different uses. Therefore, we are certain you will find exactly what you need. That said, if you are having trouble finding the perfect product, please contact us. We would be happy to help in any way we can.